I went to the tent this morning and started packing our equipment. The KIA Service Center did not finish working on our van until noon. By the time we got equipment and clothes loaded we were able to leave Lexington, North Carolina about 2:30 this afternoon. We arrived at the cabin on the Okatoma River where we will be staying in Seminary, Mississipp about 12:00 a.m. Needless to say we are tired. We are very thankful for the little cabin by the river. While Mary was out driving around this afternoon the check engine light came on again. The KIA folks said the timing belt had jumped a cog. They tore it down this evening and said they would finish the job in the morning. They did give us a loaner car. That's a blessing. Our check engine light has been on for a couple days so we took our KIA into the KIA dealership in Winston-Salem this morning. They charged us $665 for a tune-up and injecter cleaning. The good news is that we were able to get it fixed and they gave us a rent car so we did not have to sit at the KIA dealership all day. God is always good. Thank you Lord. These North Carolina folks sure know how to get ahold of heaven. I am surprised the police did not come. I have never heard so much shouting and praising God in my life. It was a very cold night but with the heaters we were warm and cozy in the tent. The service was great and we loved it. I added a Wilson Amplifier to the Sprint Data Card and we never lost the internet even one time. Still not a great picture but at least we were able to broadcast a consistent picture. We got to the tent this morning at 9:00 a.m. to start setting up. Our tables were not there and neither was anybody to help. Mary and I unloaded the van and I started doing what I could to set up. Somewhere about 10:30 a.m. Bro. Brandon showed up with our tables and we started setting up. We had a great service tonight. Since we are using our Sprint Data Card to broadcast we can not broadcast a very quality picture. We also lost the internet several times during the broadcast. The preaching and singing were great. We attended both services (morning & evening) at the Currytown Baptist Church. The singing and preaching were fantastic. We really enjoyed the services. Sunday night the Holy Power of God came down. I've never heard so much shouting and praising God. When we arrived in Tyro this afternoon they had already pitched the tent. It is a very large tent. They said they could seat 400-500 people. That's BIG! We are staying in the prophets chamber at Spruce Street Baptist Church. A very large facility with 3 bedrooms and two baths. A very nice place to stay indeed. This house decorated for Halloween in Gaffney, South Carolina caught our eye. I really like the tree house. We made it through Cades Cove in Smokey Mountain National Park this afternoon. It was much different than we remember some 25 years ago. The traffic was bumper to bumper most of the way around the loop. It was still beautiful but not as much so with all the people crowded into the area. We did not plan to spend the night in Gatlinburg, but it got dark on us and we wanted to finish our trip through the Smokey's in the daylight so we found a motel and spent the night. The side walks were full of people going to and fro. We decided to start our journey to North Carolina a Day early and spent some time in the Smokey Mountains. We got away about 2:30 this afternoon. With all the trees looking so pretty we thought this would be the thing to do. We make it almost to Nashville and spent the night at a Best Western in Dickson, Tennessee for $49.50. It's very nice. We are loaded to the gills. The TriCaster Studio presented a new problem today. I received an ATA Flight Case with the TriCaster. I have it very full of equipment and it is very heavy (the one pictured is not mine). Thanks to my friend Glen who helped me carry it downstairs to the van last night. It takes up a lot of room. I was able to eliminate one large tub of equipment by putting the equipment inside the ATA Flight Case. Tomorrow will be the problem of getting all of Mary's clothes in the van with it already full of equipment. I did my third event tonight using the TriCaster Studio. The challenge tonight was that I had two different presenters using powerpoint presentations. I queued them both up on my laptop running Newtek's iVGA program. It transmitted the powerpoint presentations to the TriCaster through the local network without any wires attached to the Tricaster from my laptop. This was very impressive. I was able to do lot of picture-in-a-picture putting the presenter in the corner of the powerpoint. I love it. This morning was my first real use of the TriCaster Studio. I was able to Live Stream the morning services, project the song service on the church overhead projecter, and make a DVD of the service using TriCaster Transistions and Titles. I thought it went very well for my very first event. Tonight I did the same thing again except I had to follow a fast moving preacher. That was a real challenge. I love the TriCaster Studio. I setup the TriCaster Studio and 3 Sony Cameras at Crystal Hill this afternoon. I plan to broadcast the service tomorrow with the new setup. I am really nervous about this. The TriCaster can do so much. I have spent every waking moment that I could since it arrived this past Wednesday studying and taking Class On Demand. I've done all I know to do, now I just need some practical experience before my first event in the field. We plan to take it to North Carolina later next week for our first field trial in a Tent Revival. So far I love it and have learned how to do a lot of things with it. I just hope I can do them smoothly. Mary and I went to the doctor this past Monday. They did a blood test. They found my triglycerides were too high and my glucose was too high. The doctor put me on Tricor and I had to go in for another blood test this morning for my sugar. I really miss the 3 mile walks with Andy and Chris around the Sprint Campus. Now my body is falling apart. I spent a big part of my day today learning the Tricaster Studio. I am over whelmed with it's abilities. The things I can do are wonderful and hopefully will enhance our video work in the future. It truly is a TV Truck in a shoe box. The power for doing a professional event is there. I just don't know yet if Mary and I are up to it's capibilities. The day finllay came. We received the Tricaster Studio today. I have a huge learning curve ahead of me. So far I am loving it. 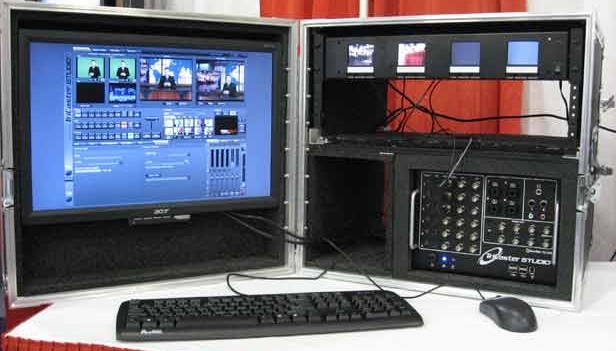 It does live production video switching and Live Streaming. The list of things it does just goes on and on. We received in the mailbox today a DVD from a Pastor in West Virginia entitled "Plenty of Time". The DVD touched our hearts. We watched it again and encoded it for the web and uploaded it to our website. I believe it could help a lot of people trust Christ as their Saviour. 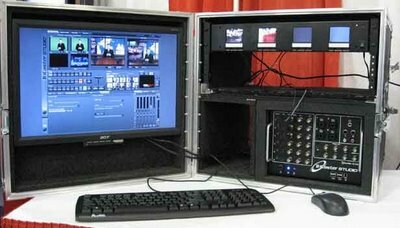 I have researched and prayed about buying the Tricaster Studio for many months. Today, I ordered it. Now I have a huge learning curve ahead of me. It was very nice today to be at our home church for a change. It seems like we're always on the road now days and don't have much time at home. Bro. Larry's message tonight was especially good. Two of the men from Bible Believers Baptist Church helped me pack this morning. Thanks to their help I was packed and ready to leave Mena, Arkansas in 2 1/2 hours. We met Scott and Lacey in Hot Springs for lunch and made it home by about 4:00 p.m.
We spent the evening listening to the services from the September 2006 Pastors and Workers Conference on North Valley Baptist Church Archive Video Files. The are fantastic. Well worth anybodies time to tune in. We sure hate to see this meeting come to a close. The Singing and Preaching have been wonderful. The people are so friendly. We will truly miss our new friends, Bro. August and Patty Rosado from Massachusetts. The good part is that we'll be with them again in November for a meeting in Goodland, Kansas. I spent my day touble shooting. We had a problem with the broadcast last night from the Bible Believers Baptist Church in Mena, Arkansas. I thought I had everything working perfectly until my brother in Little Rock called and said the audio was causing big time problems. I had it corrected within about 5 minutes but by that time we lost most of our viewing audience. Viewing audiences are not very patience. When things don't work right they go watch something else. Our first day in Mena, Arkansas went pretty well. Bro. August and Patty Rosado helped me setup. Tonight Bro. August preached his heart out about the "Last Days". I thought it was a fantastic message. I hope to have it archived on SteveBrownMinistries.com tomorrow. I spent a big part of the day packing the van with our video equipment for the big trip tomorrow to Mena, Arkansas. I have trimmed down our load. I sure hope I have not trimmed down too much. Lord willing we'll be broadcasting the Prophecy Conference live tomorrow night from Bible Believers Baptist Church in Mena, Arkansas. I spent all day going through our equipment. I tried to pull out things that I just don't have to have in order to cut down on our load. The past few trips our poor little van has been so full it was just overflowing. I've tried to straighten up and clean up all the tubs of equipment. I think I'm about ready to load up tomorrow. We enjoyed a little of the fruits of our labor this morning. We left Robby and Rachel's house this morning about 9:30 heading for Little Rock. We tuned into our live streaming video church service from Crystal Hill Baptist while driving south through Missouri. We had a good solid connection for the entire service using our Sprint data Card. We spent the afternoon house hunting with Robby and Rachel. They have been looking for several weeks and made a couple offers on house but they did not make the best offer and lost the house. The last house we looked at over in Olathe, Kansas did the trick. We all fell in love with the house and the property. They plan to make an offer tomorrow. 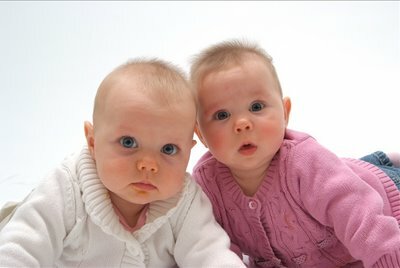 We went with Robby, Rachel, Sophie and Mady to Portrait Innvations for their 6 month offical portraits. Mary has been after me for months to make the journey to Kansas City to see our newest twin grandbabies. It's nearly 3 o'clock in the afternoon. Mary is driving and I am computing. I am mostly editing on the BEAMS Warehouse video from last Saturday. I spent another day editing the BEAMS Warehouse Video from last Saturday. This is really going to be a long project.